The Product Owner operates in a complex environment trying to get the most of what is possible from that particular configuration of Team, internal and external Stakeholders. This key role in Scrum is responsible for maximising the Return of Investment of the product by considering all the possible elements necessary to transform trade-offs in win-win situation. To the role belong not only domain expertise, but also the skill of understanding how to match the Team’s specialties with the product’s needs. Evolving in this role requires a well-balanced mix of technical and people skills, plus a sound understanding of the Scrum framework. This two-day course, organised around the learning objectives of the Scrum Alliance is the door to your certification as Scrum Product Owner. Please refer the the list below to find our currently scheduled public courses. If you are interested in having this course as a in-house or to get the upcoming dates for public courses please tell us about it using the form below and we’ll come back to you with updated information. If you are interested in having this course as a in-house or to get the upcoming dates for public courses please tell us about it using the form below and we’ll come back to you with updated information. The training is based on the most modern techniques for adult education and is a balanced mix of frontal lesson and practical activities directed to the integration of the learned content in the daily operations of the participants. We will use plenty of case studies, where possible coming from the participants. The course is intended for already practicing Product Owners, managers and developers in organisations who are starting to use Scrum and, generally, for all professionals interested in achieving the Certified Product Owner certification. What is agility and why do we need it? The course requires a basic knowledge of the Scrum process: the participants are requested to having read a basic introductory text on Scrum like Ken Schwaber’s and Jeff Sutherland’s Scrum Guide before joining the course. 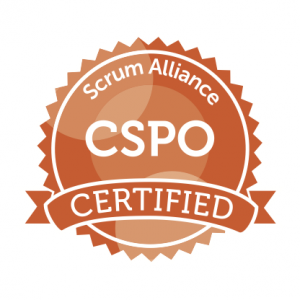 The course investment includes the certification costs and the Scrum Alliance membership for two years. The course can be delivered also as an in-house training and in English, German or Italian language. The training material is in English. I won a much deeper understanding of the interactions among Team, Customer and Product Owner. Especially the tools to develop requirements from vague ideas will help in future product development. I have learned many concrete solutions!